What's air command? What's new in Galaxy Note 5 air command? What are the 3 ways to access Galaxy Note 5 air command? This guide gives you the answer. What’s air command? and What’s new in Galaxy Note 5 air air command? Air command is a unique feature of S Pen. It allows you to quickly access some S Pen related features. S Finder has been moved to notification panel since Galaxy Note 4. Galaxy Note 5 air command introduce a new feature: use your own app shortcuts in air command. You can add up to 3 apps to air command so that you can launch them quicker. Although you can add any apps in the phone to Galaxy Note 5 air command, it make sense to add some apps that use S Pen, for example S Note or some image editor apps. By default, S Note was added already. But you can remove it from air command if you want. Please check this guide on how to add and manage apps to Galaxy Note 5 air commnad. Galaxy Note 5 air command also introduced a floating icon for air command. This is very useful for new S Pen users. A lot of new users are not familiar with the S Pen button. The floating icon gives a new option to access air command on Galaxy Note 5. Obviously, Samsung is trying to load only relevant and popular functions in air command. Image clip is merged into smart select in Galaxy Note 5 air command. 3 different ways to access Galaxy Note 5 air command? Use air command floating icon. The first 2 methods are identical to those in Galaxy Note 4 and Galaxy Note 3. The third method using floating air command icon is new in Galaxy Note 5. By default, when you pull out S Pen from S Pen slot, air command will launch on screen automatically if the phone is unlocked. this method works on Galaxy Note 3 and Galaxy Note 4 as well. Please note, if Galaxy Note 5 screen is turned off, you will get the screen off memo when S Pen is pulled out. Of course, this method of launching Galaxy Note 5 air command replies on the S Pen detection feature. Galaxy Note 5 can detect it when the S Pen is pulled out. If you really want, you can turn off air command when the S Pen is pulled out. You can change the settings in Settings—S Pen —Air command — Detach S Pen to turn on as shown below. If the S Pen is detached from the S pen slot already, you can hover the S Pen over Galaxy Note 5 screen. A circular cursor will appear on the screen. Once you can see the cursor on the screen, tap the S Pen button once. This will bring up Galaxy Note 5 air command interface. Please note, you tap the S Pen button once, not holding the S Pen button. This is a common mistake for many new S Pen users. This method of launching air command works on Galaxy Note 3, Galaxy Note 4 and Galaxy Note 5. In Galaxy Note 5, a floating icon for air command was introduced. By default, when S Pen is detached from the S Pen slot, Galaxy Note 5 air command will pop out. At the same time, a semi-transparent floating icon will be available on the screen as indicated above. After dismissing the air command interface, you can move the floating icon freely to any location on the screen. 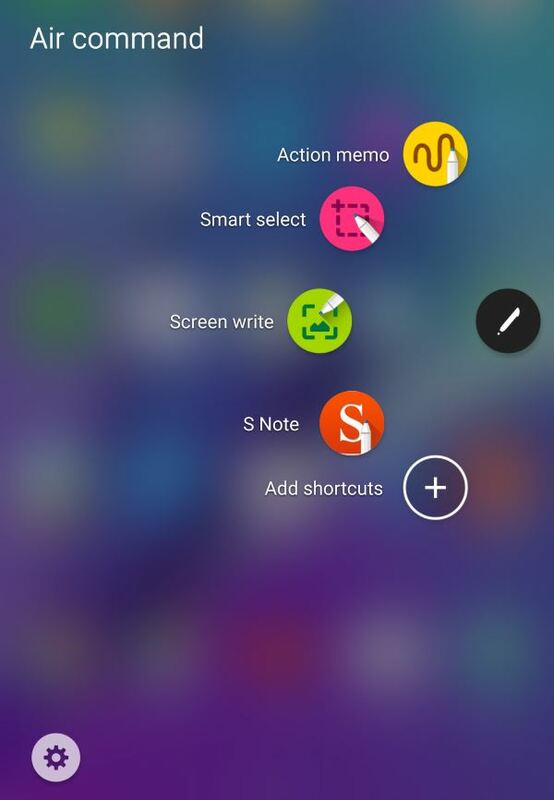 To access Galaxy Note 5 air command, tap the floating icon with S Pen as shown below. Please note, you can only use S Pen to tap the floating icon. The floating icon does not respond to your finger. 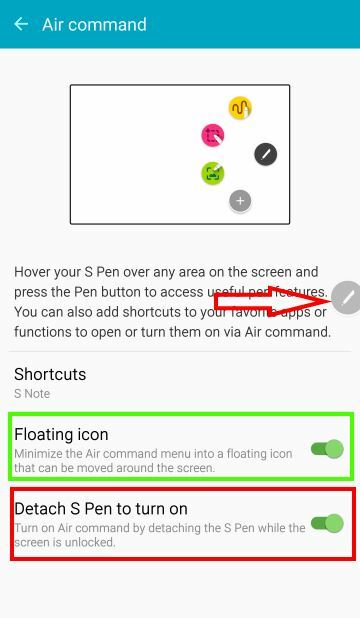 It is possible to disable the air command floating icon in Settings–-S Pen—Air command—Floating icon as shown above. How to enable Galaxy Note 5 air command when air command is grayed out in Galaxy Note 5? Some owners reported that air command in Galaxy Note 5 was grayed out. The cause of grayed out Galaxy Note 5 air command is usually due to some accessibility settings. Actually, when you enabled such accessibility settings, there were the warning message on air command. But most of time, nobody reads it. If air command was grayed out in Galaxy Note 5, you can check the accessibility settings. You need to turn off these settings to use air command. Can you use Galaxy Note 5 air command now? If you have any questions or encounter any problems on using Galaxy Note 5 air command, please leave a comment in the comment box below. Did you check settings after rebooting the phone into safe mode? i have a galaxy note 5 and everything was fine until the device suggest me to update its android software from 5.1.1 to 6.0.1 and i update it but now as you see in the link below i can not access the Air command and i can not set the detachment option to it.so it makes using s pen so hard for me.I want to know how to get the Air command back? You may backup the phone, then try a factory data reset. So what if i want to use newest version of android on my device?isn’t there any newer update that solve this problem? It’s not a known problem. You should backup the phone and try a factory data reset. Hi, i have the same “air command greyed out” problem but is there no way to get it to work without a factory reset? Also after the marshmallow update my battery drains like never before despite keeping it on power saving most of the time, location is off and all other little things done to save battery but no use, cant connect on watsapp calls for more than 3 seconds either, had more problems like apps crashing and screen turning into a rainbow but they have magically disappeared. The rest still remain. Then why don’t you backup the phone and try a factory data reset? For battery drain, always check battery usage details. Did you try to backup the phone and try a factory data reset? Bingo. It worked after factory reset. Thanks for the suggestion. Thank you for sharing the update. Enjoy the toy. Even my air command is deactivated after upgrading to 6.1. You may backup the phone and try a factory data reset. For some reason I can’t turn on air command on my Galaxy Note 5 Verizon version. It upgraded to Marshmallow recently. I don’t if that was the cause of it. Did you find the option to turn on air command? Did you try it on safe mode? The problem still as it is ? 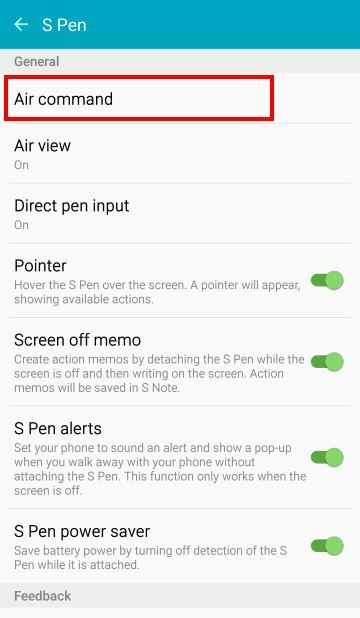 What do you have in Settings–S Pen– Air Command? If there are other problems after the update, you may backup the phone and try a factory data reset. Even my Air command option is greyed out in the settings and the air command bubble is deactivated. Is it because of the update? After doing the factory reset, does the problem still persist? If so, it is futile to do a factory reset. Guess Samsung has to update the patch. At least for mine, there are no such issues. As I know this is not a known issue. You can always visit local Samsung service centre. But I guess the first thing they will do is to reset the phone. When i select the option Air Command, the floating icon is greyed out. I am unable to Air Command. Please help. Did you try to use s pen to tap the floating icon? I have Note 5 and the Air command stopped working after I installed Norton Antivirus —- any solutions ? You already know the answer: uninstall the antivirus app. For Android phones, it’s not necessary to install such apps if you get apps from reliable sources. The new AirCommand looks a bit unusual, but still OK. Yes, air command can be improved significantly. It seems the developers in Samsung do not have a long-term plan for this feature. They always “try”. Actually, such a unique feature deserves some sorts of long-term commitment, instead of hopping from one idea to another.